Intelligent Policing is a rich resource for anyone who cares about delivering an effective policing service. It will also interest systems theorists for its practical approach to policing and inform academic debate in the fields of management and human behaviour. "Although the book is primarily concerned with policing, its message and methods will be both relevant and revelatory for students of any field of public servive and for public managers at any stage of their career." "The public sector is awash with rhetoric about evidence-based policy, doing what works, listening to the service user... How come, then, that so often what people experience is a shambles, not a seamless, responsive service? And how come good frontline service is often achieved despite the system, not because of it – and in the teeth of management directives? Simon Guilfoyle sets out to answer these questions in his new book Intelligent Policing, which looks at how systems thinking can eclipse conventional management practice. 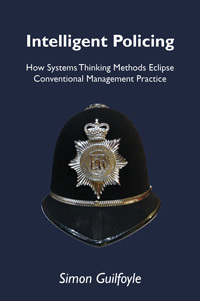 The book has been hailed as "game changing" for policing, and sets out clearly – with a commendable absence of management jargon – how to assess need and demand, deploy resources to meet that demand, get things right first time, and measure what really matters, as opposed to targets plucked out of thin air. Of course, public service leaders don't deliberately set out to cause chaos and make things worse for their customers. "There are a lot of good people out there with good intentions who inadvertently cause worse problems than the ones they are trying to solve," Guilfoyle observes. In his police career (he is now an inspector), Guilfoyle has made some of those mistakes himself – arbitrary targets, perverse performance incentives setting teams against each other, and the like. The difference is, he has learned from them, gone back to first principles and challenged the status quo. The lessons go wider than policing – this book should be required reading for anyone grappling with public service redesign." "This book could be game changing for the police service. Systems thinking theory can be viewed as complex and challenging, but not for Simon Guilfoyle. In this book he provides a comprehensive and cohesive explanation of the theory based on years of research and his practical experience of applying systems thinking in a policing context. Intelligent Policing provides you with everything you need to know to introduce systems thinking in your workplace, and to convince others to do so too!" "Traditionally, policing has been ‘managed by default’: officers are deployed with little heed paid to what they should do and how they should do it. They are usually just left to ‘just get on with it’! However, there is much that the police do that they share with other organisations. Suspects need to be admitted into custody, interviewed, fingerprinted, whilst elsewhere witnesses may need to be identified and interviewed. This may entail a more or less complex array of officers and civil staff performing different, but interlocking activities. How can such routine activities be organised and managed better than they are? Simon Guilfoyle thinks he has the answer. This comes not just from a theoretical approach developed far from the streets where real officers must work, but from a fusion of theory and practical (but reflective and thoughtful) experience of policing. Simon Guilfoyle is both an academic and a practitioner, holding the rank of Inspector in the West Midlands Police in which he has served for 18 years. Written in an accessible and engaging style this book will provoke as well as inspire its readers. Those readers should not only be other police officers, but anyone with a professional interest in policing." "Simon is a 21st century police officer. He really cares about improving how the police perform their duties. His insights into Systems Thinking and Performance Measurement within UK Policing has developed a cult following within most of the national forces. This book distils and makes accessible Simon's acumen, expertise, empathy and mass of experience and conveys it humorously and articulately to show police officers, both frontline and commanding, that by applying these principles they can make the world a better place." "Simon Guilfoyle’s Intelligent Policing will rightly attract the attention of police leaders and the policed public throughout the country. But describing his own experience, the lessons he draws should inspire every public service manager. Management is a simple activity that with the best of intentions most managers constantly make more difficult. But by thinking of organisations as systems, and focusing on purpose, demand and capacity, they give themselves the means of keeping it simple (not easy!). The good news is that using these principles managers can transform performance, morale and public perception by doing less of the bad stuff and more of the good. And not just at the top – at every level in the organisation. He did it – so can you." "Simon Guilfoyle's book is the ultimate antidote to the tick-box culture that has spread through our public services like a computer virus in recent decades. However, whereas others merely point out the absurdities and distortions that may derive from unthinking application of performance targets but have no credible alternative, Guilfoyle has shown that the problem is targets not measurement. To demonstrate this, Guilfoyle takes the reader on a fascinating journey through the various techniques of managing quality from Deming onwards, showing how statistical process control can, through analysis of variations, tell us far more than targets which distort whatever they are intended to measure. What makes Guilfoyle’s book different is that these concepts and theories are not only presented with a wealth of practical examples from policing and other fields, but the author’s approach is itself developed from experience gained over many years as an operational police officer working and managing in one of the UK’s most challenging urban environments. The book is thus no armchair polemic or technocratic discourse, but a set of principles, theories and techniques that have been tried and tested over years. What it shows is that there is no substitute for applying intelligence to the problem of quality in public service delivery, and that the shortcut that performance indicators appear to offer is an illusion that can have devastating consequences. Guilfoyle’s book presents complex theories and techniques in a clear and engaging style that is accessible without being simplistic and is ideally suited to use on training courses as well as being an ideal textbook for public sector management. Although the book is primarily concerned with policing, its message and methods will be both relevant and revelatory for students of any field of public service and for public managers at any stage of their career." "Targets, MBO, cost-cutting and other misguided management behaviour is demotivating officers, destroying performance and eroding public confidence. In his book, Guilfoyle offers a comprehensive and compelling alternative that should be on every Senior Officer’s agenda." "This book tears the faltering heart out of the way things have always been done and replaces it with a super-sleek, ultra refined approach that will leave many senior management chilled to their very bones! Inspector Simon Guilfoyle encourages managers, most of whom are stuck in a world of performance targets and knee-jerk priorities, to ditch their current belief systems and adopt a 'systems thinking' approach to their work. A proportionate, measured response will always reap far greater rewards than one born from uninformed management interference based on insufficient and inappropriate data. A real eye-opener for those who currently seek to prove their worth through the presentation of skewed statistics and re-invention of old policy. Bin the targets, acknowledge that there are some acceptable risks and empower your staff….just a few of the changes that might actually make a difference. I just hope that there are some out there who are brave enough to take up the challenge..."